Abstract. Most large-scale hydrologic models fall short in reproducing groundwater head dynamics and simulating transport process due to their oversimplified representation of groundwater flow. 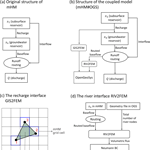 In this study, we aim to extend the applicability of the mesoscale Hydrologic Model (mHM v5.7) to subsurface hydrology by coupling it with the porous media simulator OpenGeoSys (OGS). The two models are one-way coupled through model interfaces GIS2FEM and RIV2FEM, by which the grid-based fluxes of groundwater recharge and the river–groundwater exchange generated by mHM are converted to fixed-flux boundary conditions of the groundwater model OGS. Specifically, the grid-based vertical reservoirs in mHM are completely preserved for the estimation of land-surface fluxes, while OGS acts as a plug-in to the original mHM modeling framework for groundwater flow and transport modeling. The applicability of the coupled model (mHM–OGS v1.0) is evaluated by a case study in the central European mesoscale river basin – Nägelstedt. Different time steps, i.e., daily in mHM and monthly in OGS, are used to account for fast surface flow and slow groundwater flow. Model calibration is conducted following a two-step procedure using discharge for mHM and long-term mean of groundwater head measurements for OGS. Based on the model summary statistics, namely the Nash–Sutcliffe model efficiency (NSE), the mean absolute error (MAE), and the interquartile range error (QRE), the coupled model is able to satisfactorily represent the dynamics of discharge and groundwater heads at several locations across the study basin. 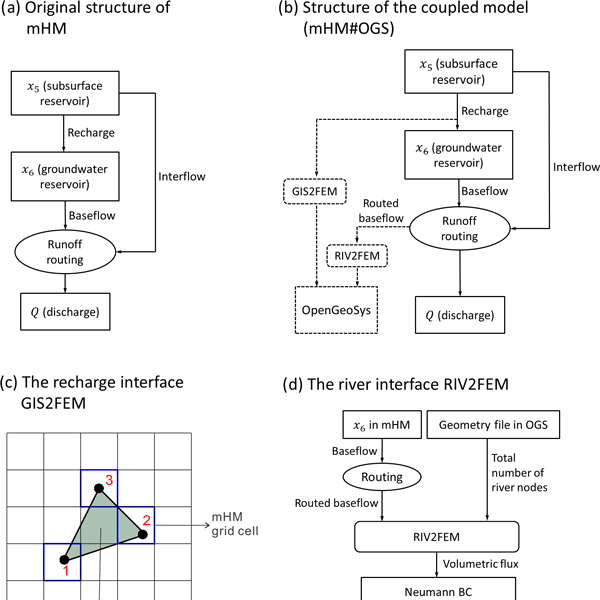 Our exemplary calculations show that the one-way coupled model can take advantage of the spatially explicit modeling capabilities of surface and groundwater hydrologic models and provide an adequate representation of the spatiotemporal behaviors of groundwater storage and heads, thus making it a valuable tool for addressing water resources and management problems. How to cite: Jing, M., Heße, F., Kumar, R., Wang, W., Fischer, T., Walther, M., Zink, M., Zech, A., Samaniego, L., Kolditz, O., and Attinger, S.: Improved regional-scale groundwater representation by the coupling of the mesoscale Hydrologic Model (mHM v5.7) to the groundwater model OpenGeoSys (OGS), Geosci. Model Dev., 11, 1989-2007, https://doi.org/10.5194/gmd-11-1989-2018, 2018.